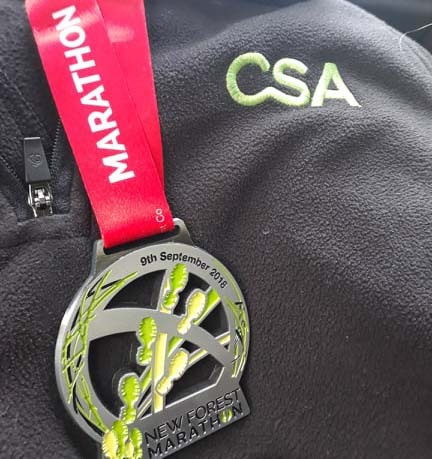 Following on from last month’s success, where four people from CSA successfully took on the challenging 100 mile Prudential RideLondon event, CSA’s ecologist Ali Shaw successfully completed the New Forest marathon. Ali took on the challenge to continue the fundraising achievements for the charity Thrive, a really worthwhile project CSA are currently supporting. The picturesque 26.2 mile multi-terrain course included views of forest enclosures, open heathland and of course, the famous New Forest ponies. Despite having a fall at mile 12 Ali made it to the finish line to gain her medal and the pride of raising £190 for Thrive. https://www.justgiving.com/fundraising/ali-shaw2. Thank you to all of those who have supported our riders and runners this summer. These were not easy challenges, but your support not only got our team through their respective challenges, but also raised a grand total of £1,360 for Thrive!